Wall Street banks are struggling to sell billions of dollars of loans they made to finance the corporate buyout boom, a sign that investor appetite for riskier debt remains muted despite a robust autumn rally in other financial markets. The slowdown threatens to cool the surge in mergers-and-acquisitions that has senttakeover volume in 2015 to record levels, thanks in part to easy credit. Bank of AmericaCorp., Credit Suisse Group AG and Morgan Stanley are among the banks wrestling to sell loans they made to back purchases by firms including Lannett Co. and Apollo Global Management LLC, according to investors. “This is the longest sustained downturn we’ve seen in the markets in a while,” saidMichael Kaplan, a deal-financing partner at law firm Davis Polk & Wardwell LLP. For now, loan investors have lost their appetite only for the riskiest deals while relatively high junk credit ratings still attract buyers. Investment banks are growing reluctant to back new deals with heavier debt loads or in troubled industries like energy and pharmaceuticals. That in turn makes it harder for potential acquirers to capture takeover targets. The stresses contrast to a boom in sales of debt considered less risky, or investment grade. The banks must sell the loans by year’s end to minimize holdings of risky assets that require capital charges under new regulations. But buyers have lost their taste for riskier loans because prices of such debt dropped sharply in September and October, saddling investors with losses. Now bankers are being forced to heavily discount the new loans to clear their balance sheets, investors and bankers say. Banks must make up much of the difference when loans they make are sold at discounts by giving up their fees or taking losses, an unwelcome prospect at a time when M&A deal-making has emerged as one of their strongest businesses. Morgan Stanley is laboring to sell a $1.2 billion loan it made with other banks backing generic-drug maker Lannett’s purchase of Kremers Urban Pharmaceuticals Inc. Investor interest dried up last week after Kremers disclosed the loss of a major customer. Loan fund managers are increasingly leery of the drug sector because of turmoil at Valeant Pharmaceuticals International Inc., investors and bankers say. Credit Suisse Group AG has been trying since early October to distribute $525 million in loans it made with other banks for private-equity firm Apollo’s buyout of OM Group. The bank has been unable to find buyers so far, and it is in the process of cutting the price of the debt, investors say. Bank of America Merrill Lynch last week reduced the price of a $1.2 billion loan to barge operator American Commercial Lines for its purchase of AEP River Operations LLC in an attempt to attract loan fund managers, according to S&P Capital IQ LCD. Banks chase acquisition financings because they pay higher fees than standard corporate loans, but the deals come with a catch: Because M&A transactions can take months to complete, banks that commit to the loans run the risk of having to sell them in choppy markets when the acquisitions eventually close. In past decades, banks sometimes held the loans until markets stabilized, but such warehousing became prohibitively expensive because of high capital charges required under the Dodd-Frank law that was passed in response to the 2008 financial crisis. Investment banks have always tried to sell leveraged loans, which have credit ratings below investment grade, as quickly as possible to reduce balance-sheet risk, spokespeople for several banks said. While the riskiest deals, like those for Lannett, OM Group and American Commercial Lines, go wanting, companies with relatively high junk credit ratings of double-B “are still in very strong demand,” says George Goudelias, a loan portfolio manager at Seix Investment Advisors, which owns about $10 billion of leveraged loans. Credit Suisse and a group of banks received $7 billion in orders from loan investors for a $2.7 billion loan the lenders sold last week for double-B rated NXP Semiconductor’s purchase of Freescale Semiconductor, according to a person familiar with the matter. Fund managers also are eager to buy a $7.5 billion loan Bank of America is marketing for chip maker Avago Technologies Ltd.’s purchase ofBroadcom Corp., investors said. Bankers need demand for higher-rated deals to remain strong to help them sell loans for even larger transactions in the pipeline. Early next year, Dell Inc. is expected to try to raise more than $40 billion of debt for its purchase ofEMC Corp.
All leveraged loans returned 1.27% this year through Nov. 5, including price changes and periodic payments, according to S&P Capital IQ LCD. But the riskiest loans with credit ratings of triple-C or below have lost 2.85%, on average. By comparison, the S&P 500 stock index delivered a 1.96% total return over the same period. Selling low-rated loans became more difficult after stock and debt prices tumbled in August amid concern about the outlook for global growth. Large stock price swings also have made M&A buyers reluctant to use their shares as a currency, prompting more to pay cash, often prompting more borrowing. 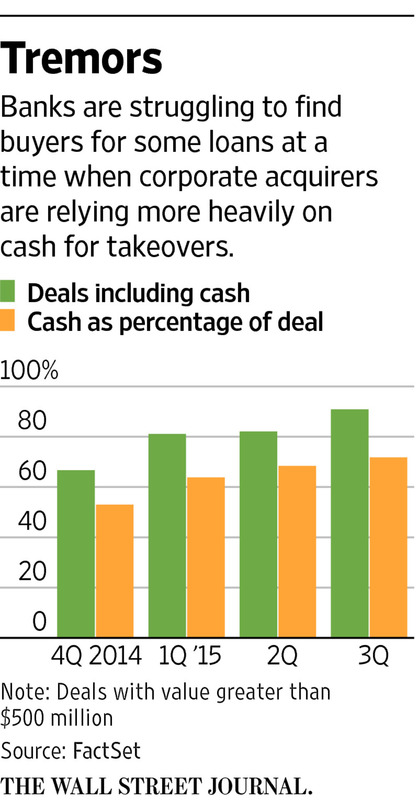 Using more cash also allows acquirers to reap more of a merger’s upside for their own investors. Since the start of October, 91% of global public-company takeovers have included cash as a portion of the consideration, the highest since the current M&A boom began two years ago, according to FactSet. Cash, including sums borrowed from banks and raised in debt markets, accounts for 71 cents of every dollar committed to takeovers in the fourth quarter to date, up from 53 cents in the fourth quarter of last year.